Millions, as Disney’s most successful Broadway venture, Beauty and the Beast: the Musical has proven many times over since its first staging in 1994. Based on Disney’s famous animated film of the same name, the musical ran on Broadway for 5464 performances between 1994 and 2007, becoming Broadway’s eighth longest running production in history. A rather formidable legacy to live up to, yet Indu Dharmasena and Soundarie David Rodrigo believe they can pull it off. When the rights to stage the musical in Sri Lanka this August was bought by the International Institute of Mystical Rose in Etul Kotte and they asked Indu and Soundarie to lend their directorial talents to the play, both were more than happy to take it on. Indu is no stranger to the story, having staged his own version back in 2002. This time however, things are a little different. For example, they cannot deviate from the original Disney version. Everything must be replicated as it is, right down to the costumes and stage settings. Costume designer Maya Ratnayake has risen to the task, creating gowns and other costumes with the most intricate of gorgeous detail. For the settings, they will rely on a video wall as the backgrounds used in the original would take up precious time and financial resources. Joining Indu, who will play the role of the ferocious yet soft-hearted Beast, is wife Sanwada, who will play Beauty. Sanwada is confident in her role as the gentle, but strong-willed Beauty. “Indu and I have very natural chemistry, so that makes life a lot easier!” smiles Sanwada. Abbasali Rozais joins Indu’s cast once again as Cogsworth, butler of the Beast’s mansion. First-timer Shane Jesudason plays Lumiere, and couldn’t be happier with his bumbling character. Lilanka Boteju is Mrs. Potts, the head housekeeper-turned-teapot famous for her rendition of Beauty and the Beast in the story. Gehan Cooray plays Beauty’s admirer Gaston. 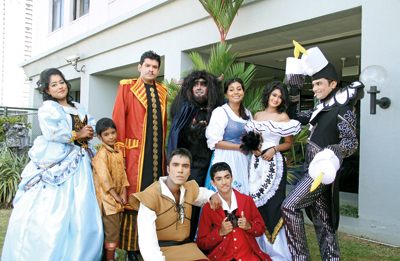 He is joined by sidekick Shaveen Illeppperuma (Le Fou), Yasal Ruhunage (Maurice), Annemarie De Silva (Babette), Thisuri Ranathunga (Madame de la Grande Bouche), and Devin Randeniya as Monsieur D’Arque. Six-year-old Thisen Perera plays Chip, the adorably cheeky son of Mrs. Potts. Thisen is the youngest member of the cast. The large cast comprises both accomplished professionals, as well as fledgling young actors from Mystical Rose. The younger thespians join in as the choir, with occasional roles as village children and in Thisen’s case, playing Chip with Shaveen as Le Fou. Working with the young actors has been a challenge of sorts, Indu admits, but all the more refreshing for it. This isn’t his first time with a younger cast-having directed several school productions and as a drama instructor for Mystical Rose he’s familiar with the younger cast members. The most challenging of all however, turned out to be the most important part of the play-the singing! “We’re completely and utterly indebted to Soundarie for any vocal talent we might display on stage,” says Sanwada. The duo has trained long and hard to get those vocals just right. For choral and music director Soundarie, ensuring that the musical standard of the production is excellent , she says “has been challenging … because not all of the cast are singers. Being so intensely involved with Soul Sounds in the last few years, has almost restricted me to working with only singers, so now the challenge is to make sure the actors sing, as well, after all it is a musical. But the progress has been good. I am happy to have the help of my Assistant Lilanka Botejue, as well as Gehan Cooray, both of them experienced singers, so the process has been easier.” She is joined on piano by Christopher Prins on drums and Neranjan De Silva on keyboard. The cast has been rehearsing for over a month and couldn’t be more excited to stage this ‘tale as old as time’. Disney’s Beauty and the Beast: the musical will be on at the Lionel Wendt on August 10, 11 and 12.